Where am I?, I wondered, waking this morning. Still in Corfu? It was hot enough at 7 am. I quickly established that I was in France by looking out of the window. No sign of the Albanian hills or the infinity pool. Back to earth! But hot! hot! hot! At the end of the garden though it was cool enough to tie up the tomato plants that had grown as much as the chickens in our week away. The bees were still snoozing so it was safe to sit on a stool and talk to the plants! Then off to Réalmont and its Wednesday market. I’d missed the markets–they are rare in Corfu. 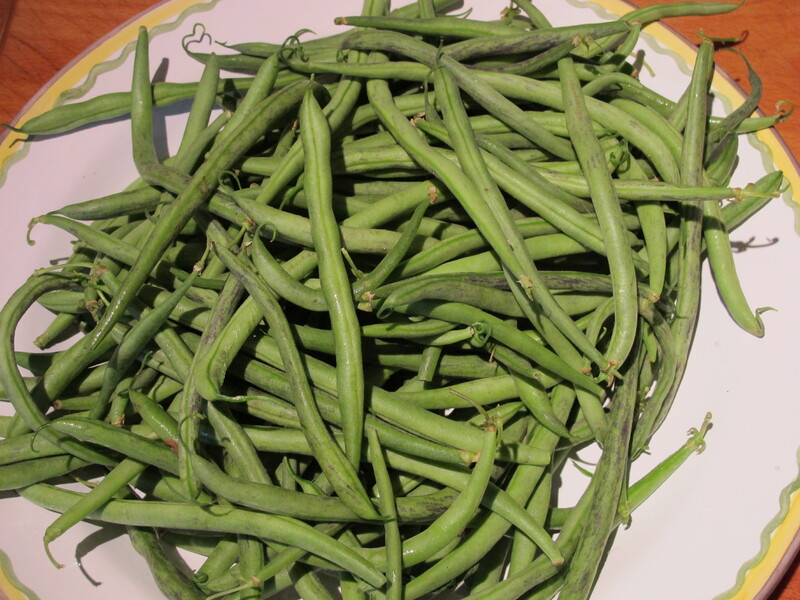 This is green bean time and here on the stalls they are piled high–picked last night I am assured. 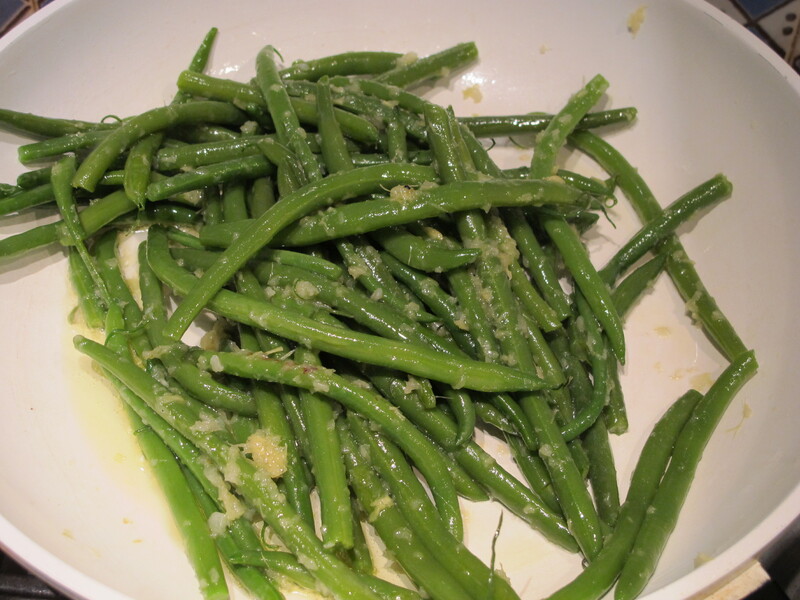 Cooked enough to be tender, yet still a vibrant green–but not too much so that they become flabby and dull in color. It’s hard to tire of them. It’s always good to discover new ways to cook them. I spotted this simple recipe in The New York Times a few weeks back. 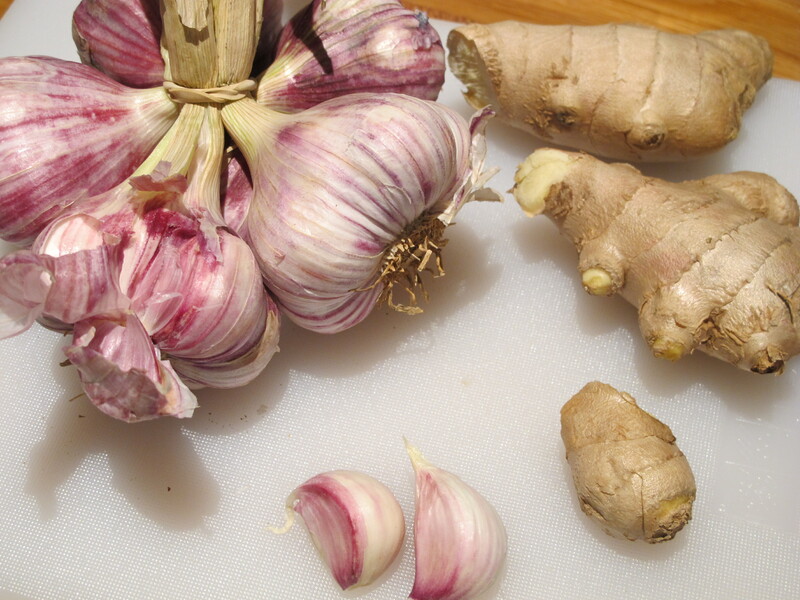 As I’d bought half a kilo of new season garlic and ginger this morning, Give it a go!, I thought. Have a bowl of cold water ready to plunge the cooked beans into. 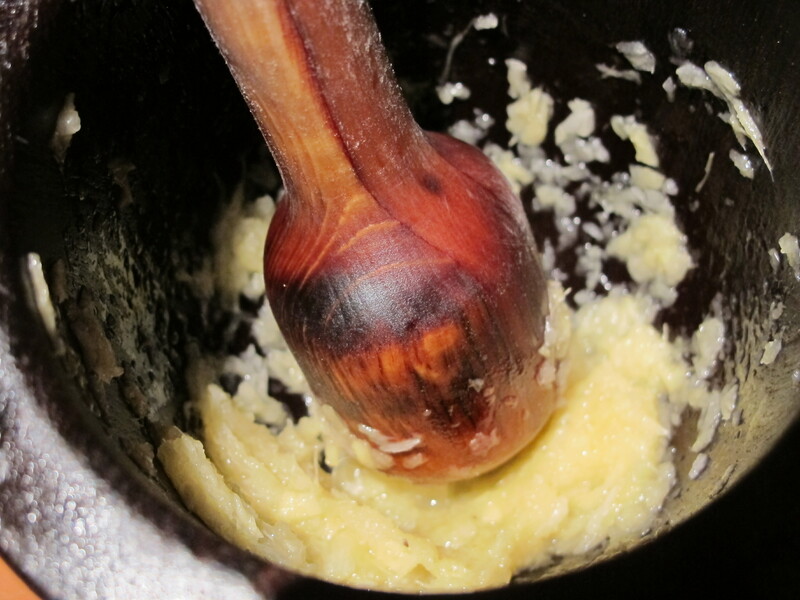 Pound the garlic, ginger and a teaspoon of salt into a pulp. Add the beans and cook them until almost tender to the bite–(a pair of cooking tongs comes in handy here to whip a bean out for a bite test). When you judge they’re ready, transfer them quickly into the bowl with the cold water–to stop them cooking further. Drain them and leave to dry a little. Add the beans and the gorgeous garlic and ginger gunge. Over a gentle heat turn the beans in the mixture until they are nicely heated through. Taste them and add more salt if needed. with a butterflied pork chop–of which more later…. Our closest farmers’ market opens in 45 minutes and I will be looking to see if anyone has beans here yet so I can cook this tonight. Thanks for sharing your Corfu adventure for the rest of us to vicariously enjoy. Sure wish I had some of your lovely Lautrec garlic! OMG, this is a beautiful website! The photos are gorgeous and the recipes sound amazing. I haven’t even noticed any typos (compulsive proofreader here). I just finished watching Poldark series I – I LOVED it on TV and looked for it periodically since then but it didn’t seem to be formatted for the U.S. But I’ve got it now!!! Looking forward to watching series 2 this week. I have nothing but time – I’m in a nursing home/rehab for an indefinite period (or longer). This place thinks a bologna and cheese sandwich on white bread is dinner – WHO would ever eat that beyond the age of 10??? The rest of their menu is similar. I’m having a hell of a time getting fresh fruit, they keep trying to give me mashed potatoes with gravy 2 meals a day, and there’s really only one real vegetable serving. I’m trying to gain some control of my weight (people keep asking me if I’m diabetic, and I say not yet, which is actually surprising), but they’re making it REALLY difficult. The worst thing about being here is that I’m DYING without my cats! I lost Dundee, the love of my life, about 2 1/2 years ago, but I still have his littermate Ben Nevis and their little sister, Barra. I do NOT do well without them (no other family)! They’re being well taken care of – I’m paying the babysitter literally more than my entire income – but she’s trying to find a foster care situation for them because they’d really like to have people around more of the time. I hate the idea of them going to a stranger, but…Ben Nevis is old and creaky 15 and needs medication so I worry about him a lot. Barra is 13 and everyone thinks she’s 4-5 – she’s very entertaining. Anyway, I’d love to read more of your cat stories. Sorry, I’m sure this is more information than anyone wanted to know. Everyone please kiss your kitties for me. Oh – another (very minor) connection. I also lived in the south of France (Nice) for over a year, back in the 70s. And I wanted to say that I read all the Poldark books over and over, quite a long time ago. I spent a lot of time visiting the U.K. during the 80s – mostly Scotland – but I did go to Cornwall (because of Poldark, of course) and managed to find the last book or two from the series there. I’d love to read them again if I can figure out where they are! The recipe looks and sounds delicious. 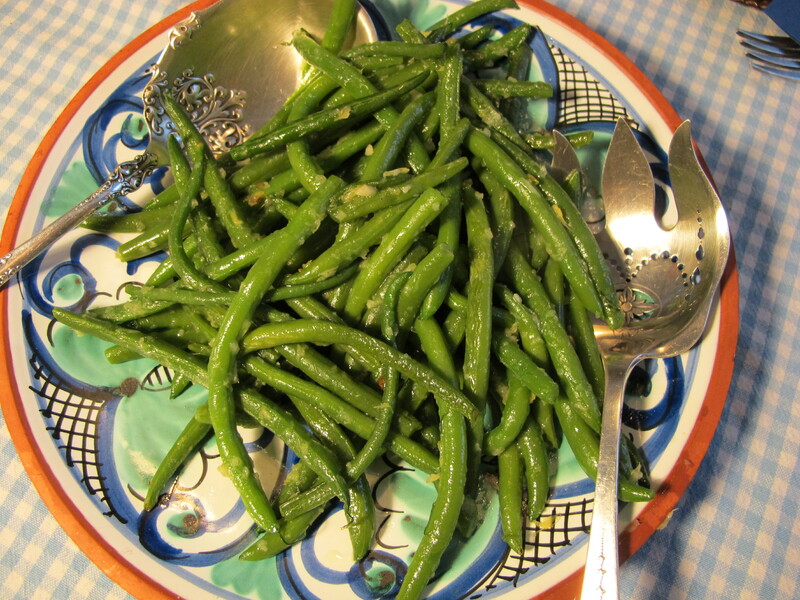 This year we are growing Asian green beans and presently they are coming up rather fast. The beans are twice as long as the ones we usually plant and I am looking forward to trying your recipe with them. Thanks! Dear Robin,My mother used to make them cooked with pieces of tomato and fine chopped union à la Française.Yummy. Memories, when I was little I had a little piece in the garden where I growed them and picked them later when they where ready. By the way ahh your safe back in la douce France, good.Hughs, Chantal.